All over the world, national borders are the subject of great contestation, and racism and xenophobia underlie this contestation significantly. With the rise in xenophobia and racism, countries, including through the United Nations, have taken action to combat discrimination and intolerance. Yet there is no serious attention to how all national borders operate with racialized effect—their default is to exclude on the basis of race. Racial Borders draws attention to the genealogy of national borders as colonial instruments of racialized exclusion, and contemporary effects of this colonial history. Immigration law and policy directly implicate racial equality, including through passports, visas and other means, and addressing institutionalized forms of racial discrimination, is just as urgent as fighting explicit racism and xenophobia. 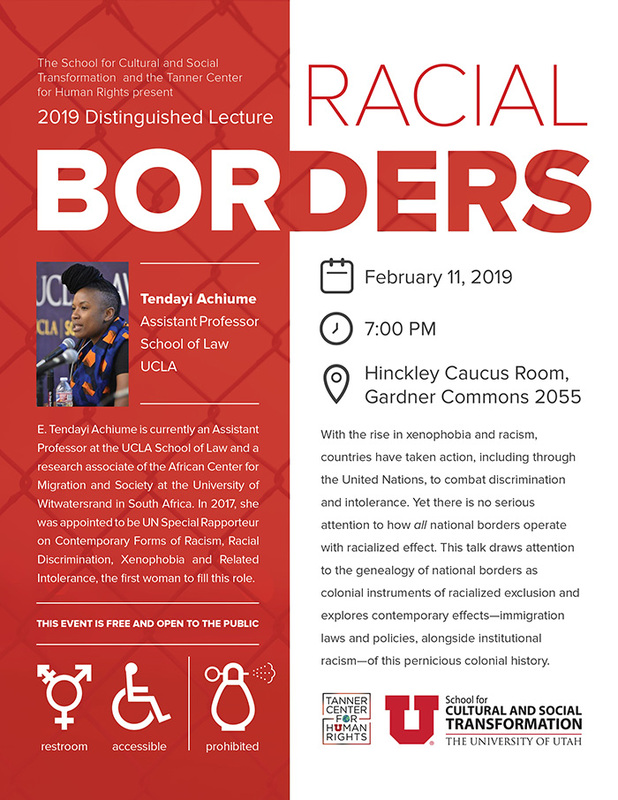 Tendayi Achiume is an Assistant Professor at the UCLA School of Law and was appointed to be UN Special Rapporteur on Contemporary Forms of Racism, Racial Discrimination, Xenophobia and Related Intolerance in 2017, the first woman to fill this role since its creation in 1993. Her work focuses on global governance of racism and xenophobia and the legal and ethical implications of colonialism for contemporary international migration. She is currently the co-chair of the ASIL Migration Law Interest Group and was named an Emerging Scholar by Diverse: Issues in Higher Education in 2018. This event is fragrance-free: attendees are asked to refrain from from wearing perfume, cologne and other fragrances. Gender-neutral bathrooms will be available and the venue will be wheelchair accessible. Hickley Caucus Room (Gardner Commons 2055) is located inside the Hinckley Institute of Politics (Gardner Commons Suite 2018).